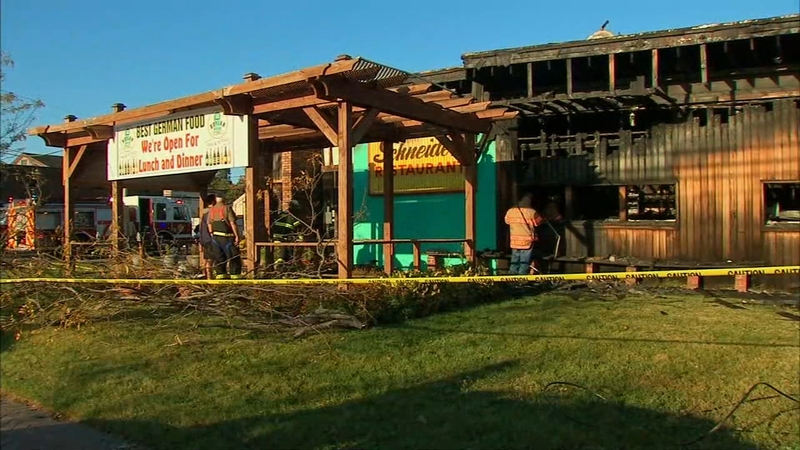 AVON, New Jersey (WABC) -- A three-alarm fire heavily damaged a landmark restaurant at the Jersey Shore early Saturday. Firefighters received a call at about 4:20 a.m. for a fire at Schneider's Restaurant on Main Street in Avon. Firefighting efforts were made more difficult by the age of the building, said Avon Fire Chief Joe Gentile. He said the fire is believed to have started in the front kitchen. "It's amazing, we were going to have dinner here last night and now it's all burned out, it's kind of shocking," said area resident Michael Lurch. "It's really sad, beautiful place, very good food," said one of the restaurant's employees, Lisa Mitros. Schneider's, which opened in Avon in 1970, is known for its authentic German food and homemade ice cream. There is no word yet on whether the owner plans to rebuild, said Gentile.